See this post for the original Multi-Scale Turing Patterns that came before these variations. This post was inspired by a comment from Jonathan McCabe on one of his pictures here. What happens when you add a fluid simulator on top of Multi-Scale Turing Patterns? I already had a simple 2D fluid simulation in Visions Of Chaos based on Jos Stam’s paper and accompanying source code so after some hacking I managed to incorporate it into each step of the Multi-Scale Turing Patterns steps. Here is a sample movie using the standard Multi-Scale Turing Patterns method. And here is the same initial start and parameters but this time including Stam’s stable fluid code at each step. This gives more whispy, hairy and vein like features. It also seems to break the cyclic repetitve nature the turing method alone can lead to. Maybe I like the change, maybe not. And finally another sample. This time with slightly more agressive fluid, histogram equalization auto-contrast (as the above sample was a bit too grey and washed out for my liking) and a pseudo 3D effect. I then tried using Perlin Noise as a displacement map to push the grid around. This sample movie is only using a Perlin Noise displacement map. 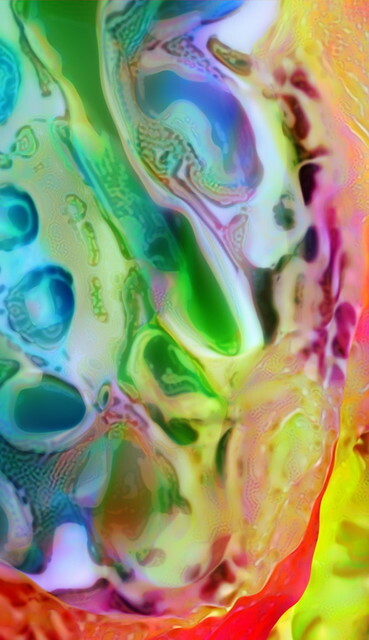 This sample uses Perlin Noise and then Stam’s Fluid. This sample uses Stam’s Fluid and then Perlin Noise. All of the above six movies were created with the latest version of Visions Of Chaos. Jonathan still continues to amaze me and recently showed off his latest works like this stunning image. I hope he shares some of the secrets behind that one. I would love to have a play around with it and add something similar to Visions Of Chaos.